If you were in any doubt that gardens can be colourful in September, check out Part 2 of our new monthly series "Best Gardens To Visit For Design Inspiration". Whether you prefer traditional herbaceous borders, modern prairie-style planting or annuals, you won't be disappointed by our choices! Naturalistic Planting at Cambo Walled Garden. Planting Design: Elliott Forsyth. Image: Chris Denning/ Verve Garden Design. Cambo House Walled Garden in September. Planting Design: Elliott Forsyth. Image: Chris Denning/ Verve Garden Design. Nestled by the sea in the East Neuk of Fife near St. Andrews (neuk is the Old Scots word for corner- I wouldn't like to be said that there is nothing educational in this blog...), the Walled Garden at Cambo House is an exceptional place. Since 2001 Head Gardener, Elliott Forsyth and Lady Catherine Erskine have had the incredible vision to combine thoroughly modern planting with the historic roots of the site. With more than 2 acres to play with, Elliott has created vast areas of prairie-style planting to lose yourself in. He has mastered the art of selecting plant combinations with complimentary forms (shapes) and textures to take the eye easily from one part to the next. However, I think that Cambo sets itself apart from many 'naturalistic' gardens by also focusing on gorgeous colour schemes, rather than than randomising colour combinations. Contrasting upright grasses such as Calamagrostis 'Karl Foerster' with mound-shaped plant forms creates a lovely rhythm that could be scaled down for domestic garden borders. Be adventurous with colour, but restrict the palette- here soft reds, pinks and blues are used, with occasional pops of white to lighten the scheme. Repeat fewer varieties of plants for a more pleasing effect- see 'Design Better Garden Borders With Repetition' for more on this. 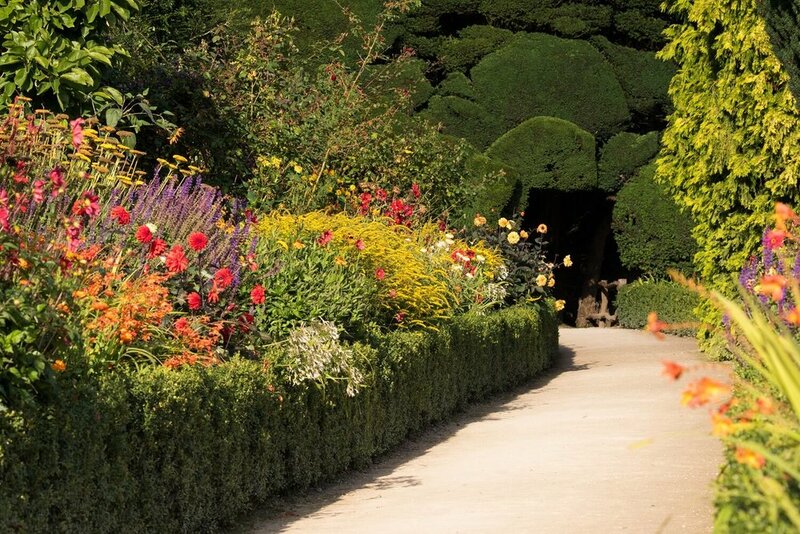 Hot Late Summer Colours in the Powis Castle Terraces. Garden: National Trust. Image: Chris Denning/ Verve Garden Design. Powis Castle Terraces in September. Garden: National Trust. Image: Chris Denning/ Verve Garden Design. The medieval structure of Powis Castle (National Trust) glows with it's red sandstone architecture. 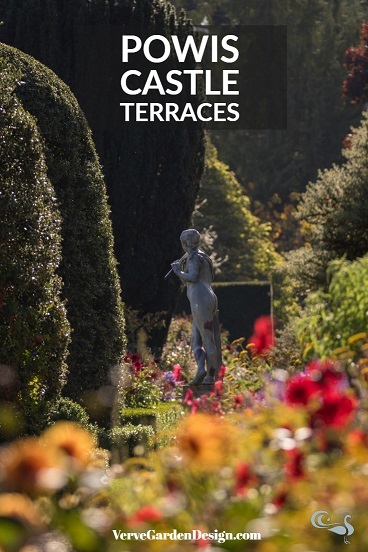 Fittingly, in September a stroll along the exuberantly-planted terrace gardens below almost feels like walking through fire. A backdrop of absolutely huge and marvellously-sculpted yew hedges show off the hot colours to best advantage and allow you to focus on the journey along the path without outside distractions. Dahlias such as 'Rip City' and 'David Howard', Goldenrod, late-flowering Crocosmia × crocosmiiflora 'Lady Hamilton' and Salvia nemorosa 'Lubecca' mingle with the exotic parrot lily (Alstroemeria psittacina), Achillea filipendulina and Salvia pratensis 'Indigo'. Don't pack your sunglasses away for the winter if you are visiting Powis Castle in September! Don't be afraid to use tall plants along a path if you have a low hedge or other border to hide and support the lower stems. 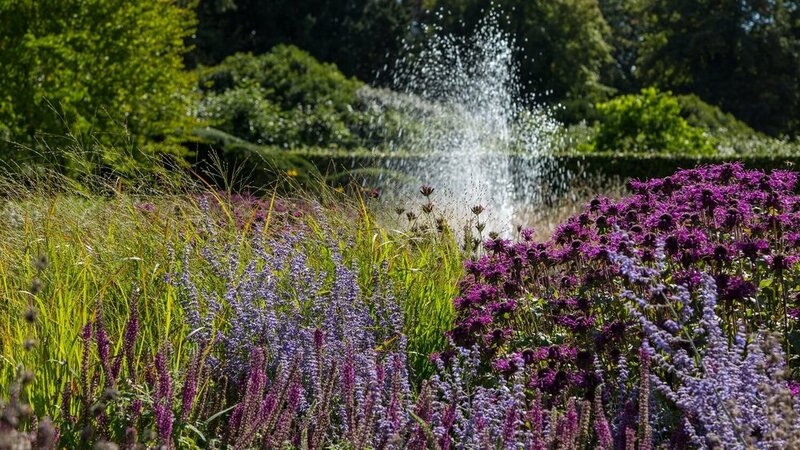 Perennial Meadow and Fountain at Scampston Hall Walled Garden. 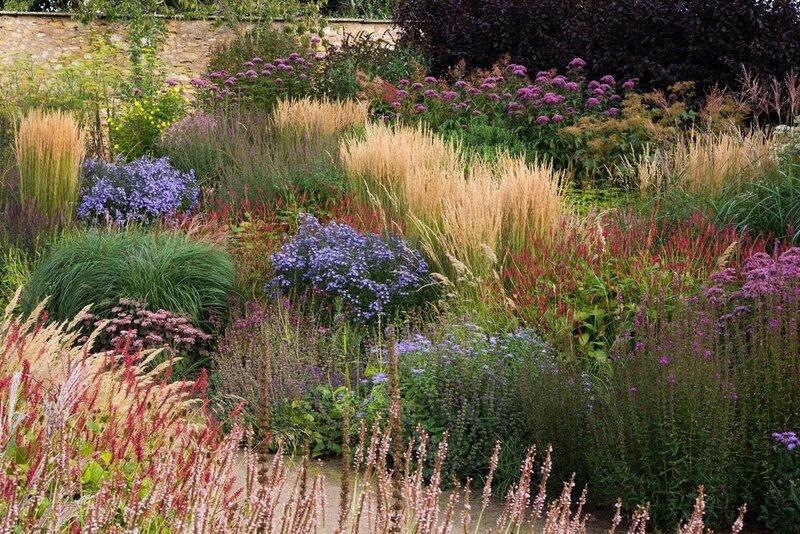 Designer: Piet Oudolf. Image: Chris Denning/ Verve Garden Design. Beauty in Decay at Scampston Hall in September. Designer: Piet Oudolf. Image: Chris Denning/ Verve Garden Design. Scampston Hall in North Yorkshire is an exciting place to see a variety of garden styles- from the 'Capability' Brown estate to the hedges, topiary, sculpted grass beds and naturalistic-style perennial meadow in the Walled Garden. 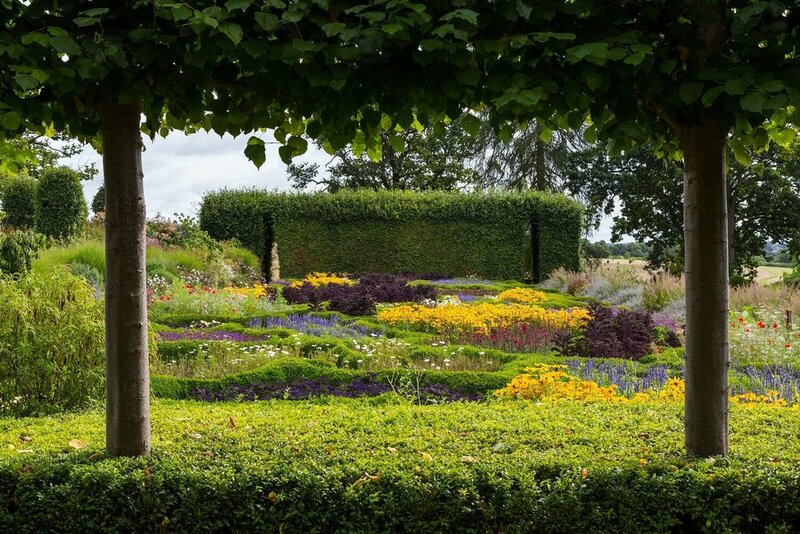 The 4 1/2 acre Walled Garden design is the work of renowned Dutch plantsman and designer, Piet Oudolf. Oudolf famously celebrates 'beauty in decay', leaving architectural dead seed heads and leaves uncut to give structure in the garden for an extended season. In September, the Perennial Meadow in front of the conservatory combines the decay of those early summer plants that are now spent with the gorgeous colours of early autumn flowers. Divided into four quadrants around a small circular pool and fountain, the perennial meadow is an interesting and lovely combination of plants at this time of year. Use grasses that maintain upright leaves and stems when no longer green as a backdrop for autumn flowering plants. For grasses try the Calamagrostis × acutiflora ‘Karl Foerster’ also used in Cambo Garden above, Deschampsia cepitosa, Molinia 'Transparent' or lower growing Stipa tenuissima. The many flowers that have garden-worthy seedheads include Phlomis russeliana or Phlomis tuberosa ‘Amazone’, Eryngium, ornamental Alliums and the Monarda 'Scorpion' shown above. Vast Pictorial Meadow of Coreopsis tinctoria at Trentham Gardens. Designer: Nigel Dunnett. Image: Chris Denning/ Verve Garden Design. Yellow Nigel Dunnett September meadow at Trentham. Image: Chris Denning/ Verve Garden Design. If you saw our post The 7 Best English Gardens To Visit For Meadow-Style Planting, you will have seen how Nigel Dunnett's Pictorial Meadow sown from annual seeds looks in early summer. By September, it has transformed from the pinks, blues and whites of Queen Anne's Lace, Cornflowers, Red Flax and Cosmos bipinnatus to acres of yellow Coreopsis tinctoria as the dominant species. These are rather lovely in the late season light and the pop of colour looks fabulous even on a grey, cloudy day. We can't get enough of it! Annuals grown from seed provide an inexpensive and easy way to add some serious extra colour to your garden. Either sow a small patch of something you fancy within a cleared patch of existing border or why not dig up part of your lawn? They are also perfect for raised beds-have a look at Raised Beds: Why Every Modern Garden Should Have Them if you would like to learn some of the advantages and styles you could use. Ready-prepared annual seed mixes such as the ones used at Trentham are available from Pictorial Meadows. They have the advantage that they have carefully selected species that will give colour over a long flowering season. We have some packets to give away- leave a comment below on this blog and we will send some to the first five readers who do! Tom Stuart-Smith Parterre at Broughton Grange. Planting Scheme: Andrew Woodall. Image: Chris Denning/ Verve Garden Design. Modern Parterre planted with annuals at Broughton Grange. Design: Tom Stuart-Smith/ Andrew Woodall. Image: Chris Denning/ Verve Garden Design. Another unmissable and wildly-colourful use of annuals in September that takes your breath away is the Lower Terrace Parterre at Broughton Grange in Oxfordshire. The organic structure of the Parterre was designed by Tom Stuart-Smith in 2001 alongside the rest of the Walled Garden. However, the psychedelic summer bedding scheme is the work of talented Head Gardener, Andrew Woodall. We love the clever framing of views into the parterre by Stuart-Smith's pleached trees and also the views peeking out from it to the surrounding countryside from the yew hedge opposite. See website for how to visit this private garden. 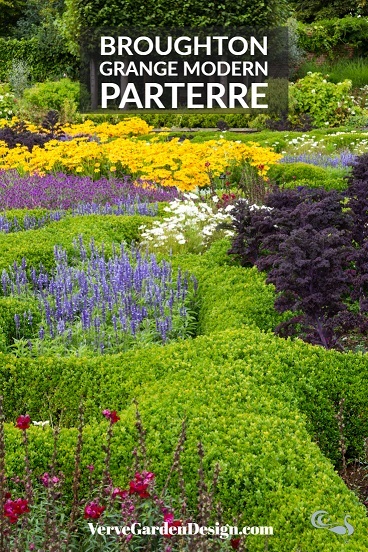 Each section of the parterre is mostly filled with just one variety for maximum impact. At home plant or sow small blocks of the same annual for a similar effect on a smaller scale. The use of kale to provide dramatic dark purple shows the benefit of considering mixing vegetables with flowers for both decorative and productive effect. You could make a similar, smaller parterre at home. Once the structure is in place, a few packs of annual seeds each year can create spectacular effect for months at little cost. In September, Heleniums, Rudbeckia and early Michaelmas daisies brighten the herbaceous border at Waterperry Gardens. Image: Chris Denning/ Verve Garden Design. Colourful Herbaceous Border in Gertrude Jekyll Style at Waterperry Gardens. Image: Lorraine Young/ Verve Garden Design. Waterperry Gardens in Oxfordshire has a lovely history. It was developed as part of the School of Horticulture for Ladies by Beatrix Havergal for almost forty years from 1932. Miss Havergal created a spectacular herbaceous border warmed by a brick wall that has a wonderful collection of late season flowers. This border is now the proud domain of Head Gardener, Pat Havers, who has ensured that the garden remains a thoroughly-modern test bed for the best varieties. We love that Waterperry is still very much a centre for education as well as a lovely garden (and plant centre/teashop!) -including a one day course on how to create and maintain your own herbaceous border. See their website for more information. 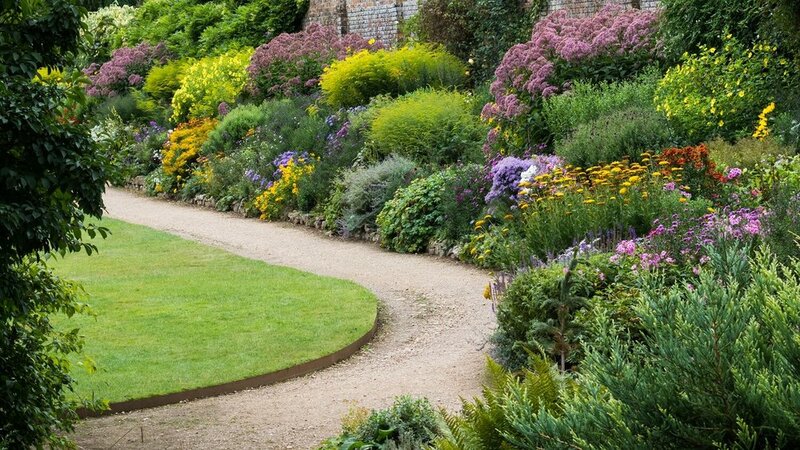 Traditional herbaceous borders graduate tall plants at the back to the smallest next to the path. Make your borders wide enough for three different height layers to create the same effect. Your borders don't need to be this long though! Within each layer alternate with plants that flower at different times for a long season of interest. Layered Planting in the Waterperry Herbaceous Border. Image: Chris Denning/ Verve Garden Design. Where is Your Favourite Garden For September Colour?